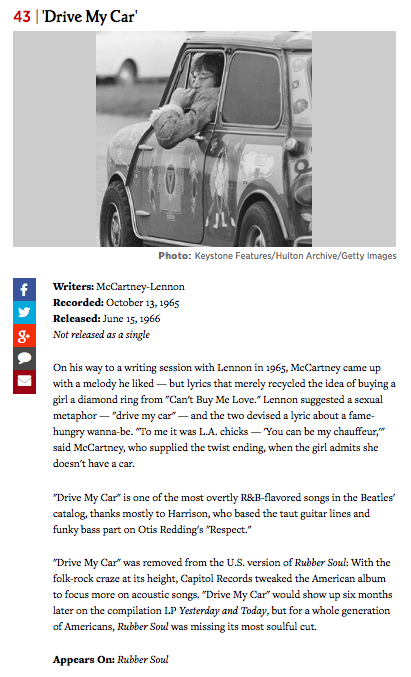 At number 43 in Rolling Stone Magazine’s list of the 100 greatest Beatles songs is “Drive My Car”. This is one of my favourite Beatles songs from this period, it is such a groovy track (to use a phrase from those times). “Drive My Car” is the opening track on The Beatles’ 1965 album Rubber Soul, a superb album which I blogged about here, it is rated number 5 in Rolling Stone Magazine’s list of the 500 greatest albums of all time. At number 43 in Rolling Stone Magazine’s list of the 100 greatest Beatles songs is “Drive My Car”. The song is a Paul McCartney composition, with a small but significant contribution from John Lennon who came up with the idea of the phrase drive my car as a sexual metaphor. “Drive My Car” shows Paul McCartney at his rocking best and his voice is great too; showing a raspiness and texture that you also hear in e.g. I’m Down”, the B-side of the 1965 single release of “Help”. At number 23 in Rolling Stone Magazine’s 500 greatest songs of all time is “In My Life” by The Beatles. I have already blogged about this 1965 song here, but you can’t get too much of a good thing. 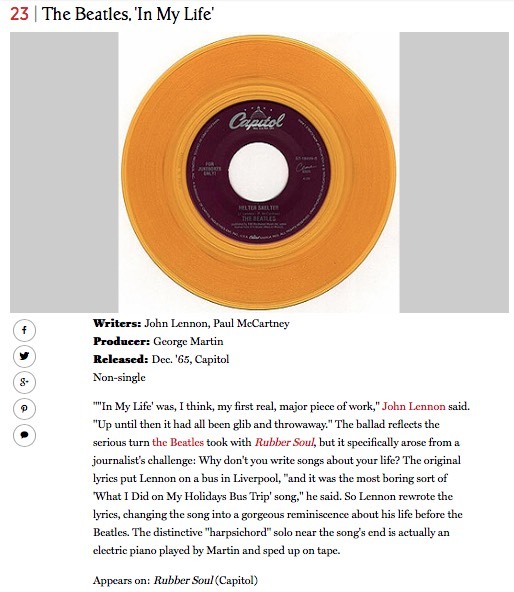 At number 23 in Rolling Stone Magazine’s ‘500 Greatest Songs of all Time’ is “In My Life” by The Beatles. This is one of my favourite John Lennon-composed Beatles songs, and is from their wonderful album Rubber Soul, an album which I blogged about here. It appears half-way through the second side of the album. 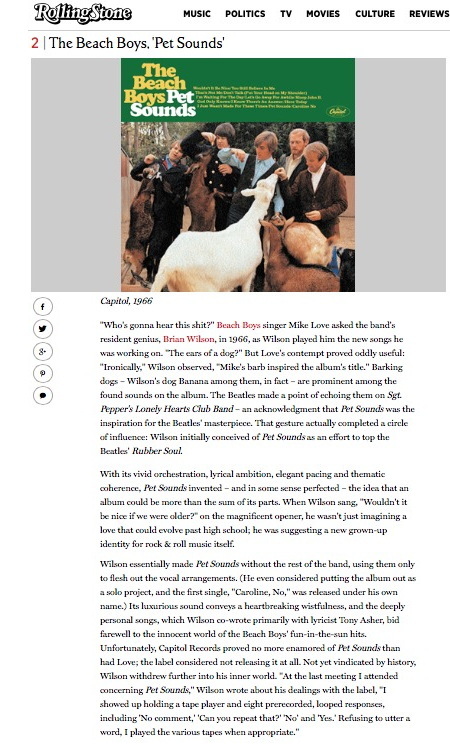 At number 2 in Rolling Stone Magazine’s list of the 500 greatest albums is “Pet Sounds” by The Beach Boys. I remember the first list I ever saw of “the best albums” in The Observer newspaper back in the late 1970s when I was about 14 or 15. I remember that this album was either number 2 or number 3 in that list (with Bob Dylan’s “Blonde on Blonde” being the other album which was either 2 or 3). Although I like the Beach Boys, I have to admit that I have never been much of a fan of this album. I just cannot get into it, groundbreaking though it may have been in its harmonies. At number 2 in Rolling Stone Magazine’s list of the 500 greatest albums is “Pet Sounds” by The Beach Boys. There are four songs I like very much on this album, “Wouldn’t It Be Nice?”, “Sloop John B”, “God Only Knows” (which I blogged about here) and “Caroline, No”, but I am not much of a fan of most of the others. I can’t explain it, as I appreciate the harmonies in the songs, and the complex musical arrangements, but for some reason these other songs just don’t do it for me. I feel I should like this album more as it is so highly rated, but there you go, I don’t. I have already shared “God Only Knows”, so today I thought I would share “Sloop John B”. For some reason, this song became the default song for rugby teams when I was in my teens; so any away match we played, we would sing this on the bus both going and coming back. What a dubious honour for a song! Here is a video of “Sloop John B”. Enjoy! Which is your favourite song on “Pet Sounds”? On this day in 1980 John Lennon was gunned down in front of his apartment in New York City. 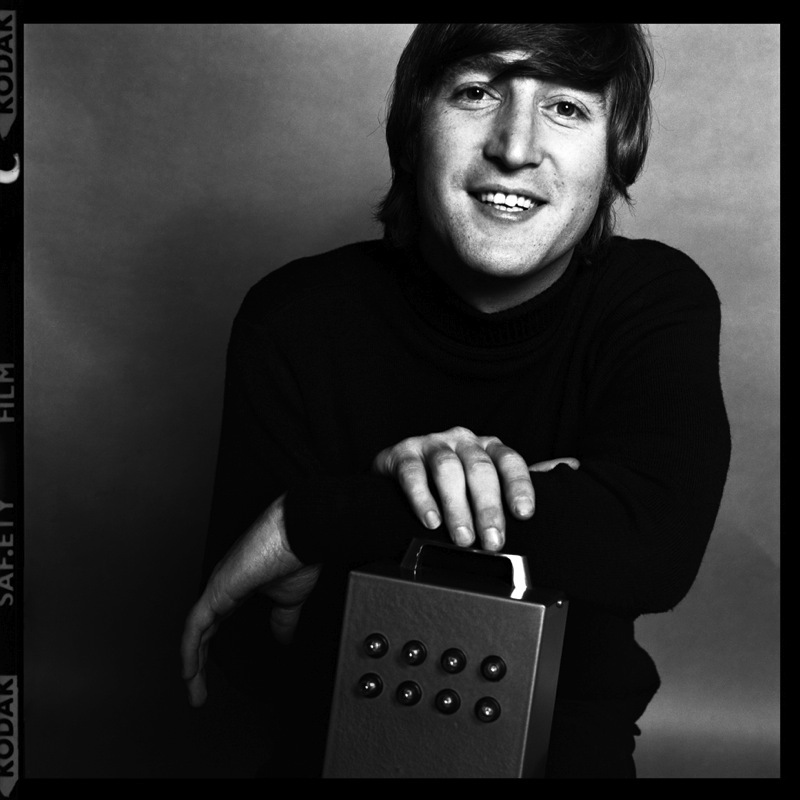 John Lennon in 1965, the year “In My Life” was recorded. Here is one of his more beautiful songs, “In My Life” from the 1965 album Rubber Soul.